CABIRIA: Moving to New York! So there's been important moves happening for Cabiria - we're moving to New York! 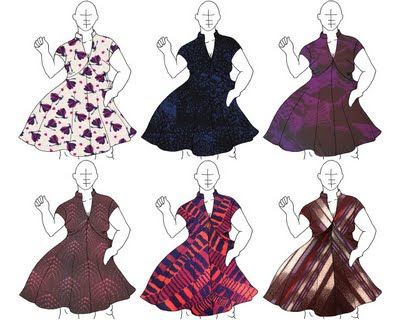 Eden has been a New Yorker most of her life, and this move will facilitate ease in working with the gifted patternmakers, samplehands, and fabric stores available in the New York area. It also means that there's a possibility that there's going to be a lull in updates over June and July as everything shuffles. Hopefully we'll be able to be up and running quickly from there. Enjoy, and hope to update you soon! Ooooh, what a delicious looking dress! Can't wait to see these come to life. Wait...what! Ok, I am on pins and needles- how exciting!!!!!!!!!!!!! I can not wait for your creations!!! I must have the blue one, btw!! Will you be back here in time for Full Figure Fashion Week? @Bevin, unfortunately I am going to miss it by about a week+, which really is bad timing. It would have been a wonderful opportunity to re-introduce myself to Gwen and all the wonderful other designers and attendees. I'm very much hoping to have the line ready for pre-sale before the next fashion season! Cabiria Style LLC ®2012 - 2013 all rights reserved. Simple theme. Powered by Blogger.